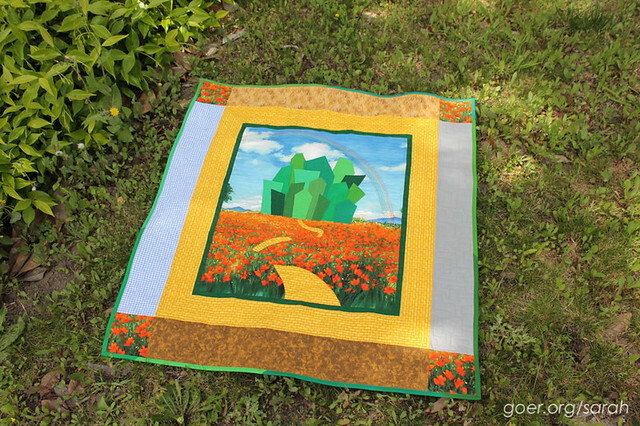 For my first entry into this year's Blogger's Quilt Festival, I've chosen my Wizard of Oz Baby Quilt for the Original Design (<--voting open through Friday!) category. Welcome to anyone visiting for the first time! When my sister told me that they had decided to decorate with Wizard of Oz for my nephew's room, I knew I had to make a quilt. However, I didn't really want to use licensed character fabric, and I don't love appliqué. 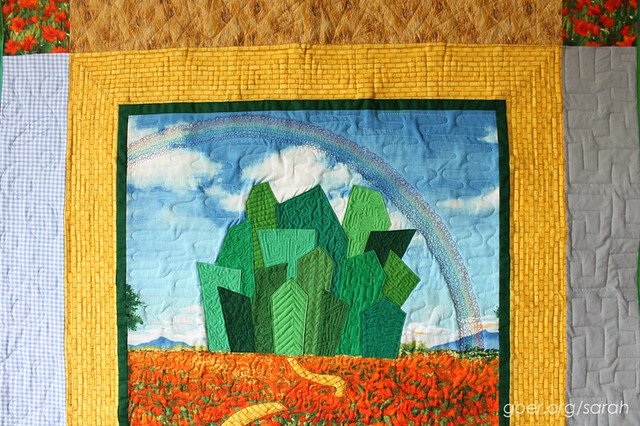 There are some beautiful depictions of Oz in appliqué out there, and I knew I didn't have that in me. 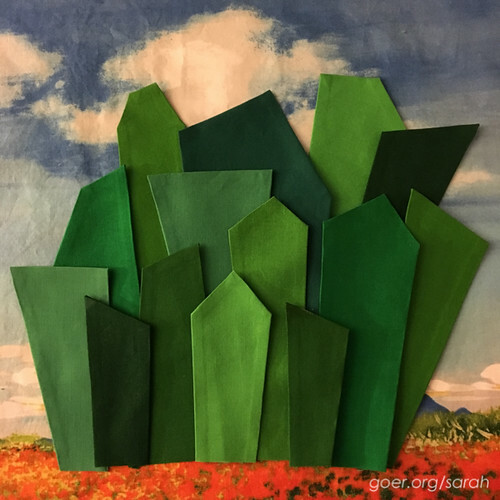 After asking my sister what her favorite elements were, I got to work, focusing on the Emerald City and the poppies. I found the perfect panel (sky and poppies) and used appliqué to attach the buildings and reverse appliqué to piece in the sections of yellow brick road. Each border represents one character: Dorothy, Scarecrow, Tin Man and Cowardly Lion. 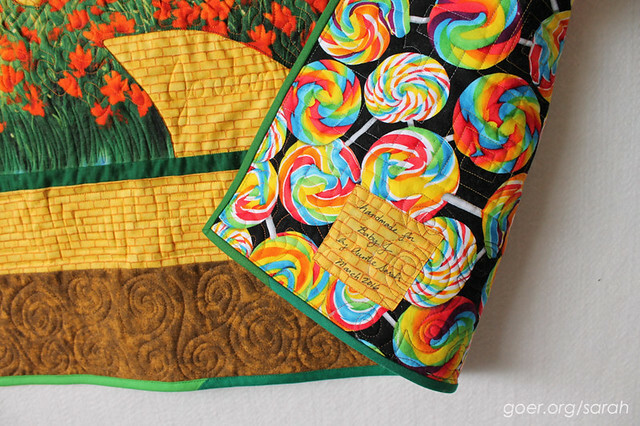 One of my favorite features of the quilt is the rainbow, which I quilted in six colors of thread. In total, I quilted in 17 different colors using 24 different quilting motifs. 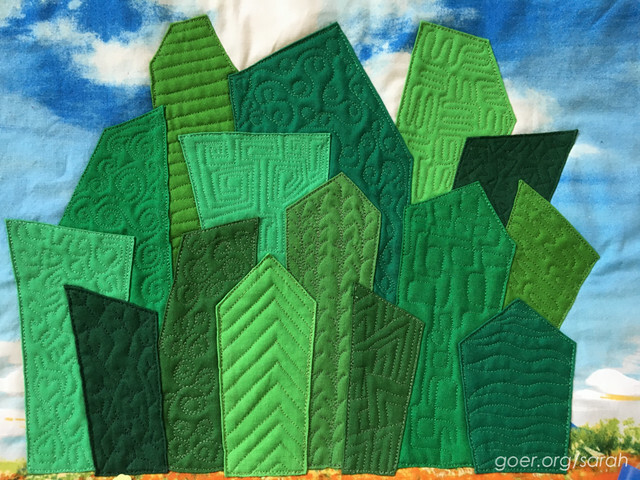 In the border sections I chose a different quilting motif for each, and also quilted an icon to represent the character. The backing featured rainbow lollipops, a nod to the munchkins. You can view the rest of the quilts in the Original Design category and starting soon you can vote on your favorites. There is so much amazing work being shown through the festival. Please visit Amy's Creative Side which has links to all the categories. Posted in Quilting. Tags: applique quilting, baby quilt, free motion quilting on September 25, 2016 by sarah. I love how this quilt came together and it is so fun to get to see it again because of the Festival, Sarah! Thank you, Yvonne. I also love the "blast from the past" posts of quilts I've seen before. I look forward to having some time this week to check out the festival! So creative Sarah! I love all the different quilting motifs and how thoughtful you were in your choices. It's a super fun quilt! I love seeing this quilt again. It's a great design. Good luck. One of my favorites of yours!! Great choice for the festival Sarah. I believe this is my favorite quilt of yours. There are so many wonderful details to it. Lovely quilt, Sarah! Love the quilting on the emeralds, pity there's no close up shot of the rainbow, it's such a fun detail! 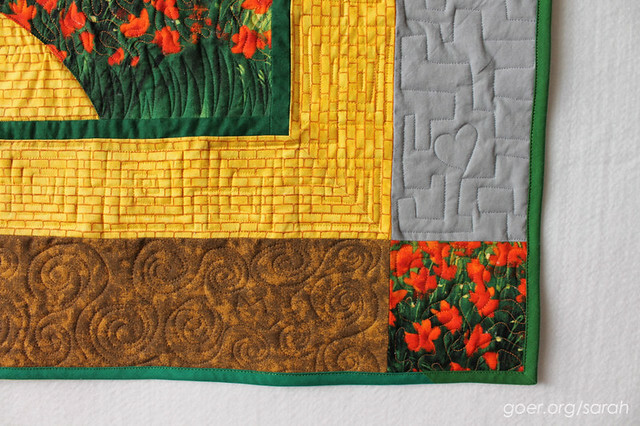 I like how you played with the shapes, the colours and the quilting. Bright and effective. What a fun theme for a quilt! I love this. The appliqué is so well-done, even if it isn't your favorite technique. Very clever to do one border per character and a special quilted symbol in each. That background panel really is perfect. I'm a bit curious if your nephew will have a mobile with flying monkeys, because he should even if it's a bit scary.